The second production of the Syracuse Stage season is both heart-breaking and hilarious. The doors to the Archbold Theatre opened 20 minutes before "The Curious Incident of the Dog in the Night-Time" began at Syracuse Stage Friday night. The venue filled up as the audience gradually trickled in. Programs open in every hand, viewers anxiously awaited the opening scene. Artistic director of the Stage, Bob Hupp, made his way to the front of the stage to express thanks, as he does every opening night, while the chatter of the crowd died down and the performance began. Based on the novel of the same name, the production is centered around Christopher Boone, a 15-year-old boy with autism, an affinity for telling the truth and doing detective work. After he is accused of killing his neighbor’s dog, Wellington, with a garden fork, Christopher sets out to find the murderer. The book, written by Mark Haddon, is relatively short, so the two-hour performance was just the right length to tell Christopher’s story. 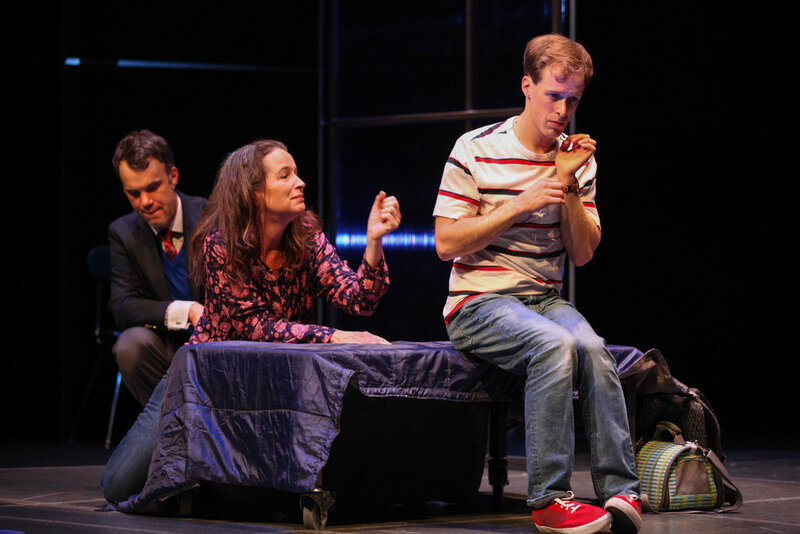 And while it does not explicitly say Christopher has autism – he’s described as having “behavioral difficulties” – this theatrical production interprets the character as being autistic, which many readers believed throughout the novel. Mickey Rowe, who plays Christopher, is the first American actor with autism to portray the character. He boasts an ability to work physically, even though many people with autism cannot. Physical stimulus was a major part of the production. Other actors touch Rowe often, and Rowe tumbles across the floor in many scenes. The show takes an interpretive route to the novel’s plot. Clear glass screens are arranged in ways to represent a new location, including Christopher’s mind. Extras without proper character names are used as narrators to some of Christopher’s thoughts and assisted in the movement of props around the stage. Elizabeth Ledo and Mickey Rowe in "The Curious Incident of the Dog in the Night-Time" at Syracuse Stage. Photo by Michael Davis. A 16-panel screen in the center of the stage displayed the contents of Christopher’s pockets during a stint at the police station and parts of a letter he finds in his dad’s room one night. It was also used as another portal into the boy’s mind as he opened up some memories, good and bad. The subtle music matched the tone of the heart-wrenching, and sometimes very comical, story. Visuals and dialogue are the most important components of the play, so any musical cues were minimal. Christopher loves space and dreams of being an astronaut, so projections of outer space, constellations and planets would fill the dark theater, mimicking Christopher’s imagination. One of the more complicated aspects of the play was its style of narration. Siobhan, played by Elizabeth Ledo, acts as a detached narrator, but also becomes inserted into the story in real-time. She reads from a book Christopher is writing and interacts with him outside of what is currently occurring, and acts as Christopher’s teacher during scenes happening in the present. While it was slightly jarring, and though she wasn’t officially introduced, it was easier to understand as time went on. Since the original story is set in Wiltshire, England, the actors performed with accents, utilizing British lingo, like “bloke,” “bloody,” and “maths.” The accents were impressive – it was nearly impossible to discern if any of the cast members actually have an accent in real life – and it added another dimension to the characters. The actors evoked a spectrum of emotions from the audience. From laughter to saddened silence, the viewers were easily jerked from feeling to feeling. With such a difficult story to tell, the actors did a wonderful job of connecting to the audience. Simple costumes and stage props allowed the characters to be more relatable, and gave audience members more to latch onto. A two-hour production that is visually and emotionally stimulating, "Curious Incident" left the audience connected to Christopher and empathetic to his story. For an engaging production, some parts comedy most parts drama, "The Curious Incident of a Dog in the Night-Time" is an interactive experience that must be seen. The show runs until November 12 at Syracuse Stage. Mickey Rowe, Constance Macy, and Robert Neal in "The Curious Incident of the Dog in the Night-Time" at Syracuse Stage. Photo by Michael Davis. Eric Parks, Constance Macy, and Mickey Rowe in "The Curious Incident of the Dog in the Night-Time" at Syracuse Stage. Photo by Michael Davis. Mickey Rowe and Margaret Daly in "The Curious Incident of the Dog in the Night-Time" at Syracuse Stage. Photo by Michael Davis. Mickey Rowe and Mehry Eslaminia in "The Curious Incident of the Dog in the Night-Time" at Syracuse Stage. Photo by Michael Davis. Syracuse Stage's production thrives on the spectacle brought by its collaboration with 2 Ring Circus. "The Lion King" continues to mesmerize audiences through most of its performances that include new choreography and orchestrations for its 20th anniversary tour.